If you are looking for fine luxury jewelry that combine beauty with elegance then this is the piece for you. The stunningly beautiful Two Hearts Sterling Silver Cubic Zirconia Necklace set features a heart pendant with a smaller joined heart, made of the finest Cubic Zirconia. The pendant and chain are made of sterling silver so it is hypo-allergenic and safe to wear all day every day. 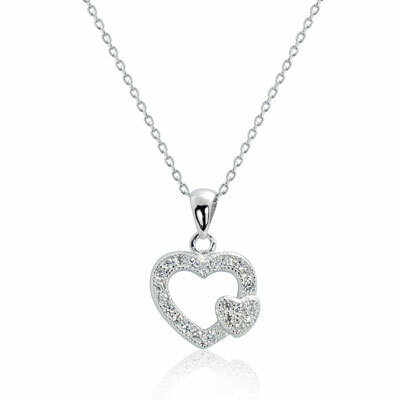 The Two Hearts Sterling Silver Cubic Zirconia Necklace makes a great gift for a special occasion or just to say "I love you" to that special someone in your life. The stunning piece features 24 small CZ stones that have been cut and placed precisely to maximize shine, luster, and color. The 18 inch long silver chain completes the set, making it ready to give and ready to wear for any occasion. See for yourself why Cubic Zirconia is the diamond substitute that people trust and discover the brilliance and beauty of these gemstones today! We guarantee our Two Hearts Sterling Silver Cubic Zirconia Necklace to be high quality, authentic jewelry, as described above.